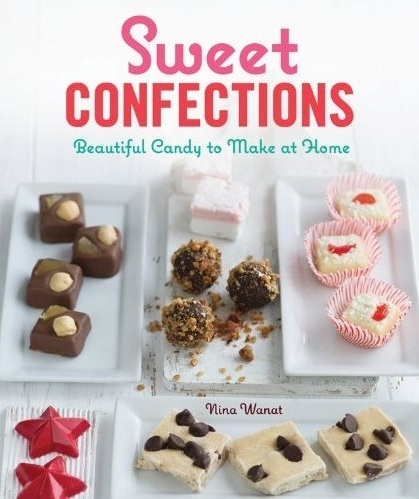 The opportunity to review the book Sweet Confections: Beautiful Candy to Make at Home comes at an opportune time. I'm currently looking to expand the ol' candy repertoire before the holidays arrive. Is there anything better than getting homemade candy as a gift? I can't think of anything better at the moment, but that could be because I'm staring down a bowl of buttery pecan pie taffy. This taffy recipe is just a small taste of what this book has to offer. Cookie dough fudge? This book has it. A sweet-and-salty smorgasbord? This book has it. It also has big, glossy images and plenty of step-by-steps to guide you to sweet success. Author Nina Wanat has packed this book with easy-to-make recipes and intriguing flavor combinations. In short, I recommend! In fact, I like it so much I'm giving away a couple of copies. To enter the giveaway, just leave a comment telling me what kind of homemade treat you like to give -OR GET as a gift. Do you like to make rum cakes or fruitcake cookies? Do you love getting peanut butter fudge or pecan divinity? 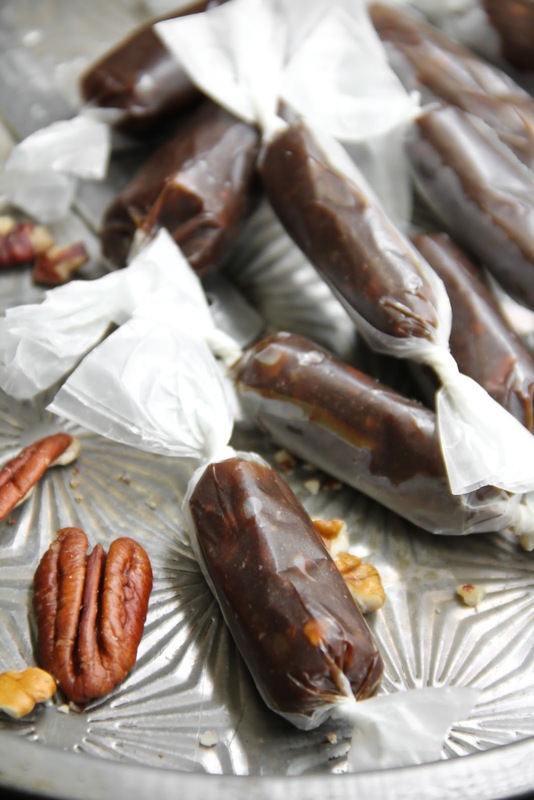 You'll love these if you're a molasses fan, and with the addition of roasted pecans, the taffy is quite reminiscent of pecan pie. I think these would be fun for something different at Thanksgiving. Heck, they'd be good for any holiday. Note: You'll need a 9x13-inch baking pan, a 3 quart saucepan and a candy thermometer. Wax paper should be used to wrap the candies. 2. Bring both sugars, molasses, water, and bourbon (if using) to a boil in a 3 quart saucepan over medium heat. Keep an eye on the mixture once it boils, stirring occasionally. It will quickly boil over if not watched carefully. 3. Clip a candy thermometer to the side of the saucepan. Let boil until temperature reaches 250 degrees F - stir constantly to prevent scorching. 4. Remove from heat and vanilla, butter, baking soda and salt. Stir until well incorporated. 5. Pour into the prepared pan and sprinkle over pecans. Let cool for 30 minutes, or until just warm. 6. With buttered hands, gather the taffy from the edges and pull until it is lightly colored and firm enough to hold its shape. Roll the taffy into a thin rope and cut into 1-inch lengths. Wrap in wax paper. Contest ends Sept. 13th, 2011. Winners will be selected randomly by utilizing a random number generator (Random.org). Winners will be notified via email and will have 3 days to confirm receipt of the email. If the winner does not reply within the allotted time, another winner will be selected. It's quite simple. I like to prepare chocolate truffles! Everyone loves these and these are so simple to prepare (plus, I get to eat so pieces of chocolate meanwhile...) The treats I like to receive: salted caramel. I just like eating it directly in the jar! I would love to try making some candy - such as caramels. I recently purchased a candy thermometer to try it out. Your taffy looks great! Those look delish! My favorite gift to give is a batch of fruitcake cookies. I always get rave reviews! I have been thinking about making candy (just to practice for the holidays, of course...) for weeks. When giving, I love to make a batch of salted caramels or some festive bark (I have a great PB and chocolate one for Halloween) for friends. Homemade candy is truly one of life's great joys. I will have to try this taffy; I have a friend who would go crazy for it. I like to give homemade canned jam or apple butter. I also love to give homemade candies - toffee and brittle. I need to try taffy tho. That's my favorite gift to get! These look like the perfect fall treat! I can taste them already and my mouth is watering! That taffy looks amazing! I really like giving jam as a sweet gift...doesn't have to be consumed right away, and you can make it in big batches. I usually give cookies, but I would love to start making candy! I love giving my holiday boxes/baskets every year. I choose 5-6 recipes that match well together & I design packaging for each one like it's a product. It's a lot of fun & work every year. People look forward to it though & that makes it all worthwhile! The pecan pie taffy looks soo good. It might have to be made for the box this year! I love giving people cookies, truffles, and anything that's covered in chocolate! i love getting a homemade loaf of bread. SO much better than any store-bought loaf. EVER. wow! this gives me inspiration to try and make pecan pie taffy cupcakes! Love, love, love pralines!!!!! Oh and anything at all with peanut butter. I love to give cheesecakes as gifts. I know that is big but there are so many variations. Chai tea, brownie bite, Blueberry, pumpkin. You can almost always find a cheesecake that will suite anyones taste bud. I make chocolate and chocolate walnut fudge in massive quantities at the holidays to giveaway. Probably the best homemade gift I've received was a tin of Russian tea cakes from my grandmother when I first moved to California (she lives in New England). They were, and are one of my favorite cookies, in large part because they make me think of Christmas as a child. I love to make coconut ice, fudge (have a mean peanut butter fudge recipe) hokey pokey (aka honeycomb - I'm kiwi it's just what we call it), basically anything that looks pretty and can be wrapped up in some cellophane and ribbon! I love giving out homemade goodie trays every Christmas. Always a different variety of cookies, bars/brownies & candies. I think everyone looks forward to those gifts more than anything store bought. Fun! Fun! Hmmm. what do I like to give? Since we are approaching Fall, we always make Swedish Ginger cookies with our fall leaf cookie cutters. When the kids were younger we used the cutters to trace leaves onto a paper bag. We gave these to all of their teachers as fall surprises. Now that they are past all of that "baby" stuff, we just make the cookies and EAT them! I like to make chocolate caramels as gifts. They travel well and are like a grown up version of tootsie rolls- everyone loves them! First off YUM! I am dreaming of how that would melt in your mouth in a variety of fabulous flavors. Now for the giveaway part. My fav candy I have ever recieved was a cinnamon carmel, it was divine. I love to give whatever I feel like baking and eating that day. Last year I made apple cider caramels and they've become my favorite gifts to make and give, but in terms of getting, my friend makes the best molasses cookies that are to die for. Great giveaway, the pie taffy sounds amazing. I love to give caramel oatmeal bars...and get anything! Heather, this is such a unique taffy recipe. You're right, they'd be perfect this fall:) Cookies, fudge, and truffles are what I usually give. This book sounds like a lot of fun! My new passion is candy making. I'm into the ole fashion candies right now. I recently made a batch of honeycomb that melted in your mouth! I'm definitely a giver. I especially love packaging them up and sending it out good old snail mail. I'm a fan of sweet and salty combinations. A couple days ago a made a batch of brown butter bacon chocolate chip cookies that were a huge hit! My favorite thing to give away is carmel corn with drizzle chocolate (I even put bacon in that as well). People go crazy over that! I have never made rum cake or fruitcake cookies before. What's wrong with me???? You had me at pecan fudge. My favorite homemade treats to give are cookies. I have a couple of "go to" recipes that I make during holidays and everyone loves them. The only thing is that they have to be consumed/enjoyed quickly (although that normally is not an issue). This book would be wonderful to have cos I can imagine my family and friends would love to receive homemade candies as well. Better yet, their shelf lives last longer than cookies! Can't wait to try the recipes in this book! These pecan pie taffy looks divine! I like to give away cookies and cupcakes...however this Christmas I'm planning on adding some jam in the mix! I love to give my vanilla chocolate chip cookies. But sometimes a few go missing before the recipient receives them. Every December my family makes tons of "Christmas Candy" (Butternut Crunch) to give to family and friends. My mother even sent me some in Africa! We love it to give and to get! This book looks like great goodies to give and get year round! I love to make bonbons for a gift ! I'm going to try to make these they would be great for Thanksgiving. LOVE LOVE !! Great pictures too. Always an amazing job !! I would love to try to make my own candy! I usually give cookies and mini cupcakes so this would be a fun change. This cookbook is exactly what I have been looking for!!! Thank you for sharing!! I've been pondering lately what I'm going to make for cookie swaps and other holiday gifts, and home made candy/treats is it! I love making hokey pokey...a rather unique kiwi thing to make but sooo delicious. Golden syrup and butter melted and warmed up and some baking soda chucked in at the end makes a good science experiment too! Now I've got my candy thermometer I'm looking forward to trying to make more candy! Truffles are my standard food gifts, but I love trying new treats. With cooler weather approaching, I'll certainly start with pecan pie taffy. Thanks - and love the photos! I love making apple pies and giving them away. Just seeing people smile because I gave them a delicious treat makes me so happy! I'm a big fan of giving people peanut brittle (or some other kind of nut; their favorite typically!)! I have a foolproof recipe, but it doesn't double well so during the holidays I'll spend a good full day making pounds and pound of nut brittles! Never fail to impress though. These pecan pie taffies look heavenly and that book looks like a dream! Cookie dough fudge?!!? Count me in! I love Buckeyes - little balls of chocolate-dipped peanut butter. My absolute favorite. I love giving a mixture of treats: always fudge, peanut brittle, toffee, and several Christmas cookies. Occasionally other treats, too. This looks like an awesome book! My favorite candy to make for holiday gifts is a caramel that i add an ale reduction to. once it is half set, i stick some pretzels in to give it a "beer and pretzels" twist. My favorite sweet treats to make for gifts are chocolate truffles. I have a basic recipe that I like and then I add liquors, extracts, nuts, fruit, and other yummy things to create varieties. You had me at Cookie Dough Fudge!! I can think of about 10 friends who would love to receive that for a gift...and, me, too! I've made all kinds of things for food gifts from the cinnamon/sugar pecans to fudge to pinwheel cookies (a family recipe) to Russian Tea Cakes to homemade pasta sauce or pesto. Now, my mouth is watering.......Thanks so much for the giveaway! My mom puts me in charge of making holiday fudge :) However, my favorite candy GIFT was definitely my grandmother's old-fashioned homemade caramels. I like to give fudge. I have several variations on a basic marshmallow creme recipe. Really easy, but really good. My favorite is peanut butter, but chocolate, maple ginger, butterscotch, and cookies & cream are good also. This sounds so amazing. 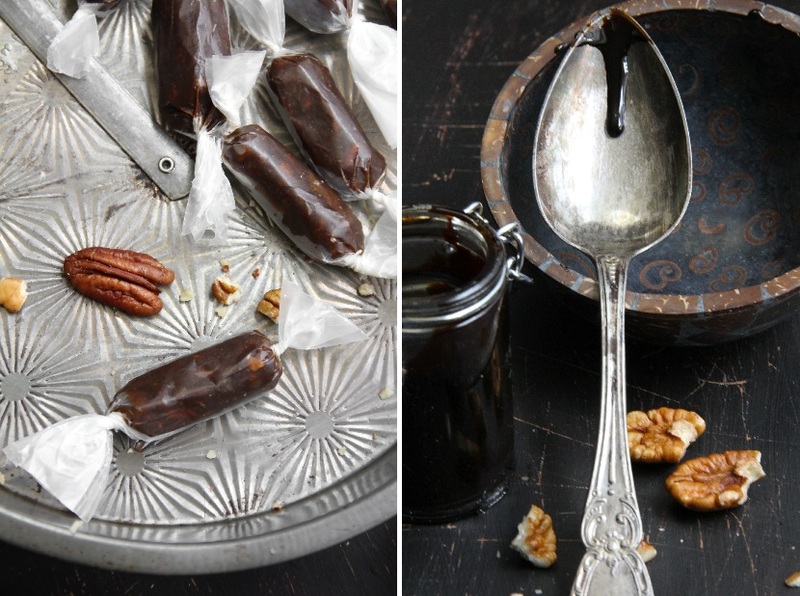 I never would have thought pecan pie could be turned into taffy. When the holidays roll around I love peanut butter fudge and english toffee. I think I could eat my weight in either one of those! I like giving gifts of chocolate dipped pretzels and cream cheese mints. I love making caramels and toffee around the holidays to give out. I love to give baked goodies at Christmas. Truffles would be on my to do list. I have yet to start giving food as gifts during the holiday season - I ought to start working on candy- and cookie-making! I do love getting truffles at Christmas, though :) And tea! I love to give brownies as a gift. Who doesn't love chewy brownies. My husband's ex-boss would always give pretzel bark at x-mas which I looked forward to ever year. I'm going to be greedy and just talk about what I like to get! My mom makes the most amazing homemade turtle candies -- she makes homemade caramel for them and everything. SO GOOD. One of the best parts of Christmas. P.S. I have a pug too -- I have a black one though. Aren't they just the best??! mmmmm...looks delicious. I like to giveaway cookies or granola. My favorite edible gifts is chocolates, especially from Sees. yum! I love to make cookies to give away but I love getting caramels or breads! I like to GET homemade chess pie! I like to bake pumpkin bread to share and giveaway. I would love to get some Pecan Pie Taffy as a gift. Hint hint, wink wink. :P No, but really, my grandma makes the BEST fudge and divinity. I'm really hoping she sends me some this Christmas since we moved away recently. I love to make chocoalte covered pretzels! I buy pretzel rods, cover them with melted semisweet choclolate, and then roll them around in colorful sprinkles. They are so easy to make and so incredibly delicious that I always make them for birthdays or special holidays. My family and friends love them! I like making my famous chocolate fudge to give out to family and friends. I also love Christmas time because my sister gives out her amazing Oreo truffles! I can't believe you said fruitcake cookies! I make those every year (for the rare few friends that like them). I make all our gifts from scratch whether they're baked, sewn, or just assembled. I love to make plain chocolate fudge to give during the Christmas season. My friends and family expect and wait all year. It is the only time I make it now. A few years ago a friend from Romania baked cookies for me, the were wonderful! I am usually the one who bakes so they were extra special. My favorite things to get have either caramel or peanut butter in them. Maybe both would be good. I am a fan of all things dessert so love your blog. Can't type because I'm keeping my fingers crossed to win your fabulous draw. I always give Yugoslavian (European) Nut Rolls. i love to give peanut butter "buckeyes" (as we call them in the midwest), brown sugar fudge/penuche (the best recipe ever from gourmet mag) and candied pecans. candy candy candy! loved nina's blog and the book looks amazing. oh my stars, i want this book!! my new favorite thing to make for others is vegan oatmeal cream pies! so good!! I love to give away old-school Italian bakery style cookies that I grew up with...pignoli cookies, rainbow cookies (aka Venetian), cucidate (date/fig/nut cookies)! I would love to get fruitcake cookies! I like giving and recieiving cookies! I know that is kind of a lame thing to say because everyone says that, but really, you can never go wrong with a good old fashioned chocolate chip cookie. Try looking at a cookie, and if it doesn't make you smile, then maybe you've had too much botox (I kid, really). But cookies are indeed magical. A friend of mine started getting into bread baking and I love getting an extra load here and there - he's really good at it! Combining delicious candy canes with chocolate (one of the times that white chocolate is actually acceptable to me) results in, well, nothing since I eat it so fast. But peppermint bark has a special place in my heart, and I would love to receive more (but maybe can try my hand at making it myself, too). i absolutely LOVE creating amazing vegan desserts from orignal, not-so-healthy recipes. i would die for some outrageous dessert-made-vegan. YUMMY FANTASY. Lately I've been baking cake pops for people! I love homemade marshmallows... put em in a smores gift box or hot cocoa jar mix! I absolutely love fudge as a gift. Its decadent and there are many varieties to please everyone. I am also a fan of baking cookies and peanut brittle is always a crowd pleaser! I make caramel every Christmas and sometimes just when I want a treat. Easy to make and so delicious. I LOVE CANDY! I love getting anything, but especially chocolate covered cheesecake balls; fudge in any size, shape, form or flavor; gingerbread anything; chocolate covered peanut butter cups; Panettone (Italian Christmas cake/YUMMY); Nanaimo Bars (Chocolate/Custard); Baklava; Halva; de Tres Leches Cake. I would love to sometime make Turkish Delights (chewy fruit squares). We usually make Pecan Tassies (mini Pecan pies/tarts) and Choregs (an Armenian slightly sweet bread with sesame seeds, shaped into small pretzel shapes and such). 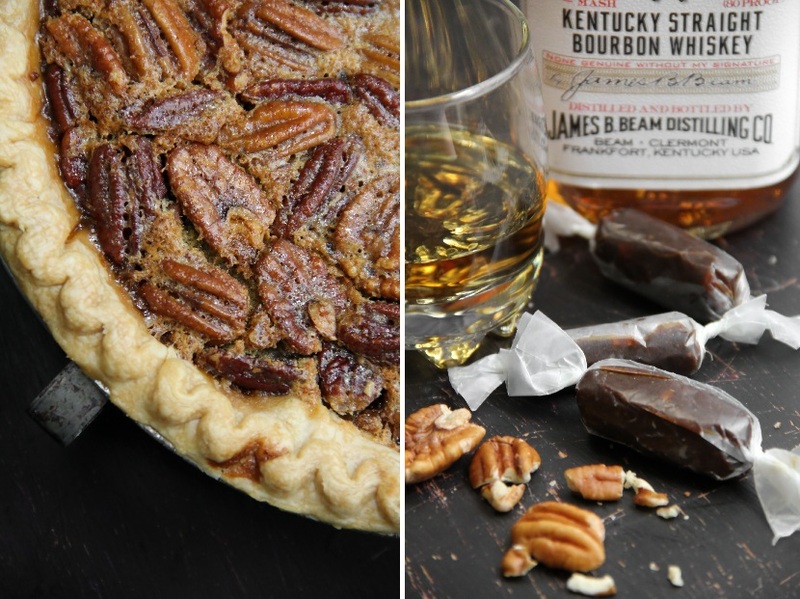 I never heard of using bourbon in pecan pie before. Interesting! I love to make Chocolate Dipped Peanut Butter Balls (not the usual recipe though, this one has coconut, graham cracker crumbs, pecans, etc. ), Barks with various fixin's, and marshmallows. I love to give and get almond roca! My mom makes the best almond roca and it is always a treat when she sends it to me. This past year I had her teach me how to make it and now I can't wait to give some away at the holidays this year! It's a motto I live by: 'tis better to give than to receive. Plus, if I didn't give my sweet things away, I'd eat them all myself! Not that there is anything wrong with that. When I'm in a bind, I whip up a batch of super simple English toffee and smother it with dark chocolate - a stupidly simple recipe from a mom of a close friend. When I want to get EXTRA brownie points (pun absolutely intended) I make mini pound cakes (vanilla bean is the winner) and wrap them up in pretty little bows. My favorite candy (to give and to get) is caramels. They're easy to make but people are always really impressed by them! that book looks lovely! I often give cookies, but should do caramels more often! I love giving everything I bake away to other people as gifts and to try. I like to try new recipes and give away the results to others for their reactions - so far, your recipes are going down a storm! My favorite candy to receive during the holidays is homemade almond roca! Your pecan pie taffy looks to die for!!!! I love toffee. My favourite homemade treat to make is chocolate chip cookies made with great quality chocolate. Man those look good! I love to receive Turkish Delight as a gift. Looking back, I don't think I have ever made a food item to give as a gift but I would love to try it out. I learned to make a confection called flodeboller from my Danish host-family during a semester abroad. They are my favorite thing to make at home for friends and family stateside. I would love to get some home-made truffles, I never have a patience to make them myself. Homemade chex mix is something I have to do when it comes around to holiday season. Just isn't the holidays without making that to give out. I love to give the swirl biscuits (just like the ones that you made) as presents but in miniature size in a jam jar tied with ribbon. They make the cutest present along with truffles. Easy and enjoyable. I've been told that it is like receiving parts of Alice's tea-party. Wonderful! What an amazing and original flavor for taffy! I love to give homemade chocolate truffles or macarons but when I lived in Germany, homemade American chocolate cookies were my most requested homemade gift. Last Christmas was my first attempt at making candy. I started simple and made chocolate peppermint truffles. They came out absolutely delicious and I'm looking for a new candy to learn to make for this Christmas! On that note, my favorite candy to receive is Dark Chocolate Covered Marzipan. There is something about the slight bitterness of the dark choclate and the sweet almond flavor of the marzipan that I just love! These sound lovely. I'd like to give a jar of pre-put together cookie mix. Love that idea! I love to get chocolate covered toffee (I have an aunt who makes the best) and I love making maple sugar candy, though giving it away is a challenge. I love to give cookies, hot chocolate on a stick or sweets which i know how to make (such as candied chocolate orange peel) as gifts. I've never received an edible gift but I'd really love anything! I love to make carmel corn or some kind of candy bark, but I seem to change it up every year. I am dying to make the cookie dough fudge, sounds delightful! Love your blog, amazing stuff! I love love love fudge. Mmmm! :-) Thanks for the giveaway! I'm usually the one giving the homemade gifts. When my husband was in Australia last Christmas, I mailed him some cookies! All your recipes just look amazing.. Wauw.. Have to try this one.. Love pecans..
i love to give homemade funfetti cupcakes with butter cream frosting! so delicious. I love to receive toffee. It's one of those things that I'm just not inclined to make myself, but love to eat. As for what I give to people? I make a huge batch of scones and freeze them (unbaked). Then I give them to friends to store in their freezer. They can have fresh baked scones whenever they want (which is usually a few weeks after the holiday sugar rush). I always love making sweets and giving them away, as well as getting them. I would like to expand my candy repertoire, though. As for my favorite, I'd say it isn't Christmas until I get petit fours, peanut butter truffles, and homemade caramels from my aunt, and buckeyes from my grandma! I love to make spiced shortbread around the fall holidays (shortbread with cinnamon or pumpkin and nutmeg). I just love shortbread and fall flavors. I also like to make shortbread for people in the summer with a hint of rosemary or lavender. I like making Butter Balls around the holidays to give away. My dad made them when I was growing up to give to the people he worked with. I love receiving homemade pecan divinity. During the holidays it just feels like the south in your mouth -- which for me is home :). I love fudge, or anything with peanut butter in, so peanut butter fudge! I'm an illustrator so I like to draw labels & typography for all my edible gifts as well, the attention to detail makes everything more special!! At the holidays, I usually make pralines, christmas scones, and red & green candies apples for my co-workers and family. I personally prefer something a little more tart - like lemon bars... mmm! caramels are my absolute favorite candy. I love getting homemade caramels and chocolate chip cookies as a gift. Very nostalgic and delicious! Giving homemade marshmallows every year with packets of cocoa! Divine! I adore fudge. It's fun to make and fun to get. I really like to go to different places that make fudge and compare. I give mini-pecan pies that I bake in mini-muffin pans. Most of my family says they are a drug in a pie shell because they are so addicting. Pretty much anything with chocolate in it. I like to give a variety of cookies as gifts, espeically because I can try out new recipes. last year I made Caramels, homemade peppermint patties, and candied citrus rind for christmas. All three were a hit..... and that was the first time I ever made candy! I'm hooked! I love making truffles. I always make several different kinds to give away to neighbors and friends as a Christmas treat. This book would definitely give me some new recipes to try! I love to give away cookies!! You can never go wrong and kids love them. Your taffy looks amazing. You are truly one of my favorite girls and your talent blows my mind. It inspires me!! I love giving cookies.. I've always wanted to try making candy to give, but I'm a little scared to try it at home.. alone.. boiling sugar and all that..
well, I've been on a jam/jelly/marmalade making kick the last couple of months. Dearly beloved likes to THINK we are going to give them away at Christmas to friends and family....we shall see just how many are left! I usually do homemade cookies/truffles to give away for the holidays. This is a tough question... i love to try new recipes all the time so usually my gift giving depends on what recipes i want to try out, last christmas peppermint cupcakes in a jar were the most well received. The taffy seems good, it's something I've never heard about before. I like to prepare cookies and cakes for my collegues, they'll swallow them in a day. My preferred for holidays are ginger bread cookies, a tradition from my home country. Quite honestly, I'd like to get THESE pecan pie taffy pieces as a gift. I love both taffy and pecan pie, LOVE them!!!! And to give, I like giving peanut brittle, pumpkin fudge, and mini pound cakes. My husband's Aunt make the best holiday candy/sweet treats. Puppy chow is my fav. and her peanut butter fudge is outta this world! Our favorite to give is chocolate dipped Oreos. They're so simple, but everyone loves them! Oh my goodness. These look and sound amazing. Your photos are really beautiful. As far confection receiving goes, I looooove homemade peppermint bark, peanut brittle and caramel corn. Oh, heck. I'd take just about anything someone wanted to make for me. :) Thank you for the chance to win the book! oh my gosh Pecan Pie Taffy! I'm saving this!!! I like making caramels! Easy - and one recipe yields a huge batch. They last a very long while too :) But would love to expand my repertoire! I enjoy making caramels. I make them in the microwave - they are so easy. Right now, my latest craze is caramel, however, I LOVE LOVE anything that has a cotton candy flavor to it. I love receiving pumpkin bread from one of my BFF's. She always surprises me with it for no particular reason. I also like to give caramels made with her secret recipe that has never failed me. Well judging from the photos I'm thinking my new favorite treat to give and get is gonna be pecan pie taffy! I love to give jar pies or jar cakes as presents - the jars are easy to dress up in any theme. I love to get saltwater taffy from my east coast friends as a present when they visit me. Ooooh, DANGEROUS book! I really like making (and receiving) truffles! OMGoodness...I am going to try these! Typically, I made "white trash" and put them in decorated pails! Always a hit!! I love homemade caramels. This year I plan on learning to make them and experiment with various flavors. I love all kinds of homemade brittle. i love any type of candy that contains chocolate…taffy, brittle, fudge! thank you for including me in this giveaway! I love giving homemade jams and jellies. I think homemade candy would be a great addition in a little gift basket! Lately I like making cake balls- so fun to do different variations and to decorate them for the season. I like making fudge, and I like receiving anything sweet at all! I will usually make cookies to give aways, but this year I really want to make up baskets of pastries, jams, pickels, canies, etc. This book sounds great! I love to make sugar cookies for gifts. In fact, that's usually the only thing that my mom asks for at Christmas. I make chocolate puddle cookies - always a hit! I think i want THAT taffy! It looks great! This looks amazing! I love the idea of pecan pie in candy form. Last Christmas, I made homemade marshmallows to go with homemade hot chocolate mix for stocking stuffers. This year, I'd like to try homemade candy canes or an almond toffee. 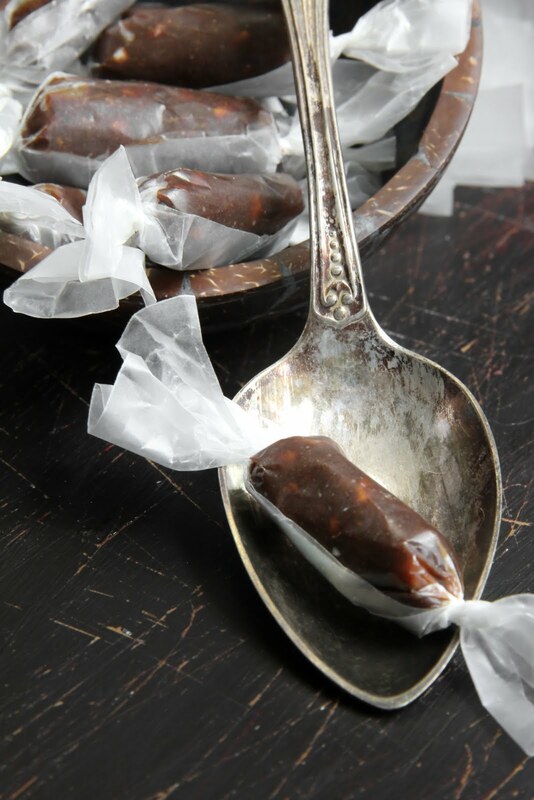 I also have a strange desire to make my own cough drops, but I don't know if anyone would appreciate receiving them as gifts! Usually we give dipped and deorated pretzels (rods and twists) and spicy/sweet almonds or pecans. I'd like to add these to our repertoire, though! I love homemade Mounds bars! Oh they are to die for!! My Grammy makes them at Christmas, and I fight everyone for the leftovers! Sixlets Cake for a Blog Birthday, and a Giveaway!